In October 2010, we started www.SynBio.Fuerundwider.org – a website dedicated to the discussions on societal impacts of synthetic biology. The website operates with argument maps; most of them are produced with Compendium. Other elements are comments, Open Eds, news regarding synthethic biology, and summaries of the ongoing discussion in the maps. 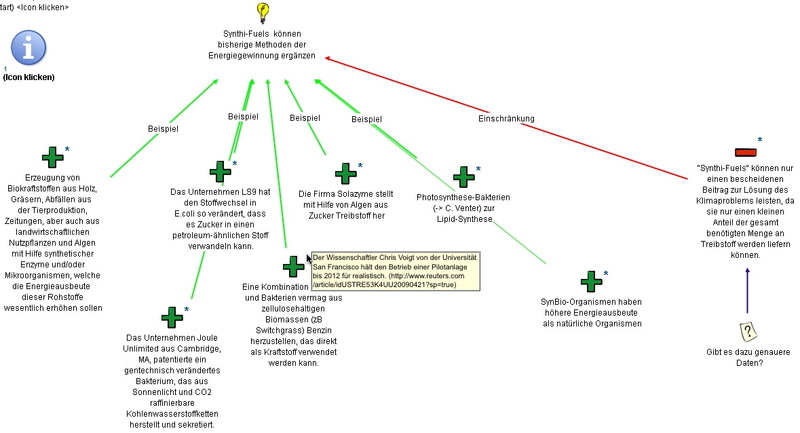 The project – a pilot to prove the practicability of our concept of guided online argument mapping – was funded partly by the Deutsche Akademie der Technikwissenschaften (acatech) and supported by Wissenschaftspressekonferenz e.V. (WPK). Before going online, we assembled reports and recommendations on synthethic biology that have been published in the last years. With this material, we started to build our maps. Next, a moderator approached stakeholders in the field (i.e. scientists, NGOs, company representatives and politicians) and asked them for help to work out critical points in more detail or to resolve remaining questions (e.g. Do synthetic organisms, due to their fundamentally new and incomparable nature, require new methods of risk assessment? Will our understanding of ‚life’ be changed by synthetic biology?). The contributions of a number of stakeholders, that we collected via email, via the comment section on the website, and via telephone conversations, were integrated into the growing map. A jury (consisting of: a journalist, an NGO representative, a scientist and a biotech-entrepreneur) ensured that all sides of the debate were represented equally. Our results: Overall, the role model of our approach turned out to be not only a typical online-debate but rather the online-version of a stakeholder conference. Within just a few weeks, we were able to involve about two dozen experts in the discussion and collect their arguments. The online-maps did a great job in organizing and guiding the conversations with our experts, which in turn advanced the map further. Our goal (which was accomplished) was to create a map that all contributors agreed upon (in terms of fair and thorough representation of arguments). We are confident, that at least in those areas of the debate that we covered, the gathered material is much more detailed than what can be found in most of the literature that existed beforehand. The results were presented at a Parliamentary evening event in Berlin in November 2010. 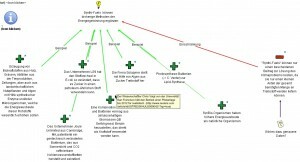 The map will also serve as a tool for critical assessment of future reports, such as the report of the Technology Assessment Buro (TAB) of the German parliament, which will start its work on a report about synthetic biology in Spring 2011. ALASI2018: Educational Data Scientists: A (Less) Scarce Breed?